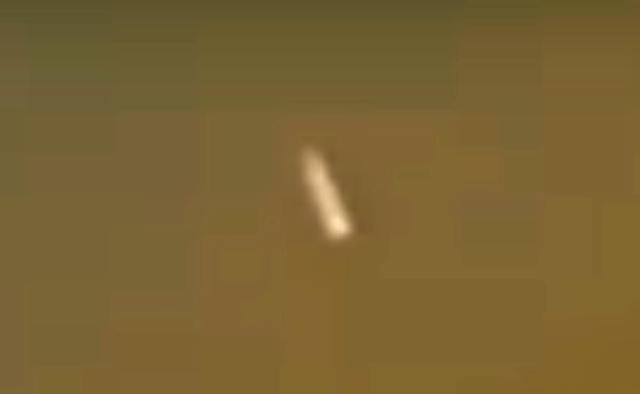 UFO SIGHTINGS DAILY: UFO Descends From Space and Then Splits Into Two Over Ohio, Oct 2018, Video, UFO Sighting News. UFO Descends From Space and Then Splits Into Two Over Ohio, Oct 2018, Video, UFO Sighting News. When an object falls from space with a trail this big...it should in world news...yet nothing about this object exists except this one video by an eyewitness. The object is moving too slow to be a meteor or space junk. The speed is slow and controlled...and I don't want to say its aliens...but it's aliens. "Thought maybe a plane was crashing saw a light descending then a black piece came off...My daughter and I were driving to the store. We both noticed a light in the sky ahead of us and it looked like it was descending. I said is that a plane crashing ? We couldn’t figure out what the orange like light was. I pulled over and we saw a black piece come off. I thought maybe an explosion was next and we stopped the car to look. Then the light moved and a trail seemed to follow. But then it hovered. We watched as it began to move again stop and then a trail. It was very slow. We were bewildered. Never saw anything like it. We decided to drive the direction but then lost it in the trees. We were both very confused for quite a while we kept looking for another half an hour. Not sure what it was, seemed to slow for a meteor or fireball. The black piece that came off was also very confusing"